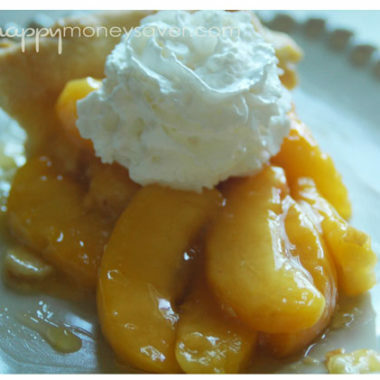 Learn how to make this delicious fresh peach pie. In your food processer add ¾ cup flour, salt and sugar together until combined, about two 1-second pulses. Add butter and shortening and process until dough just starts to collect in uneven clumps, about 10 seconds. Take rubber spatula and scrape down side and bottom of bowl. Add ½ cup flour and pulse until mixture is evenly distributed around bowl and mass of dough has been broken up, 4 to 6 quick pulses. Empty mixture into a medium bowl. Take the ice-cold water and sprinkle it over mixture. With a rubber spatula, use a folding motion to mix, press down on dough until dough is slightly tacky and sticks together. Flatten dough into a 4-inch disk. Wrap in plastic wrap and refrigerate at least 30 minutes or up to 2 days. Adjust oven rack to lowest position and preheat oven to 425 degrees F. Remove dough from refrigerator and roll out on generously floured work surface to 12-inch circle about 1/8-inch thick. Trim overhang to ½ inch beyond lip of pie plate. Fold overhang under itself; folded edge should be flush with edge of pie plate. Flute dough or press tines of fork against dough to flatten against rim of pie plate. Use fork to prick bottom of dough. Line just the top crust with foil. Bake for 15 minutes. Remove foil, rotate plate and bake for 5 to 10 additional minutes, until crust is golden brown and crisp. Let cool to room temperature. Peel and slice peaches. Add peaches to a bowl, and while they sit there pour a cup of orange juice over them. Take a few of the most misshapen peach pieces and try to juice them. Put them in a tight-weaved strainer and press the juices out. Just get about 1/2 cup with as few chunks in it as possible. If you want to skip this step you could also just buy some peach nectar in stores I hear (although have never tried that myself). Take that 1/2 cup peach juice, add 1/2 cup orange juice and 1/2 cup water. Whisk the sugar, cornstarch, Sure-Jell, and salt in a medium saucepan. Stir in the juices, making sure to scrape the corners of the pan. Cook over medium-high heat, stirring constantly with a heatproof rubber spatula, and bring to a full boil. Boil, scraping the bottom and sides of the pan to prevent scorching, for 2 minutes to ensure that the cornstarch is fully cooked (mixture will appear frothy when it first reaches a boil, then will darken and thicken with further cooking). Let cool to room temperature. Drain the peaches in the orange juice. After the glaze sauce has reached room temperature add the peach slices to the glaze. Fold gently to mix them until they are all coated. Scoop the peaches and glaze into the pie crust. Refrigerate pie until chilled and serve!